Trust. That is what ten of the spies lacked. They saw with their own eyes that the land was just as God had said it would be. They saw how God protected them and sustained them in the desert. Yet they focused on the difficulties of the situation. 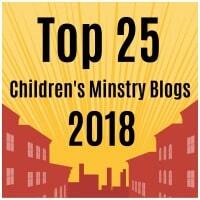 We want our kiddos to be like Caleb. He saw the promise of God before him. He had total trust in God and in His promises. We should teach our kiddos to trust in God, even in the face of difficult obstacles and that is what this craft will remind them of every time they use it. Cut out the leaves and the grapes. You will need around 20 grapes. Cut out the Trust template. Glue the leaves to the Trust template. Then the grapes. Cut of any excess grape overhang so that there is a clean edge. Glue onto a piece of white card stock. Cut it out leaving a small border of cardstock. Then glue onto a piece of purple construction paper. Finally cut it out again leaving a small border of purple construction paper. For a variation you could use different shades of purple for the grapes. I have also included an “I Am The Vine” template as a variation to this craft. 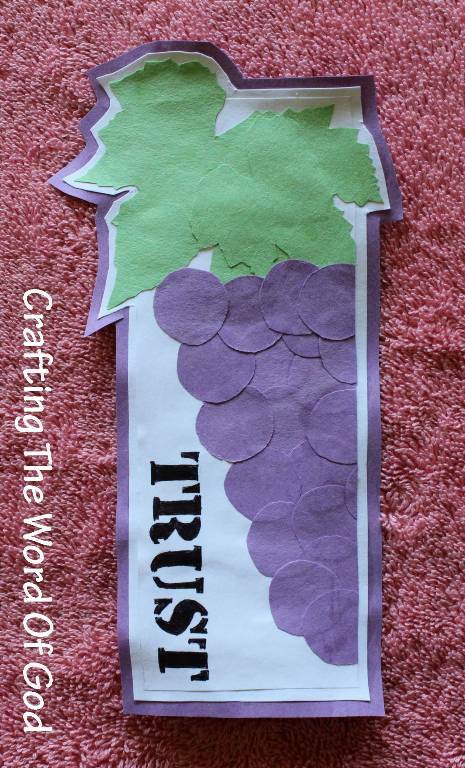 This entry was posted in Bible Crafts, Joshua, OT Crafts and tagged 12 spies, bible crafts, bookmark, craft, crafts, faith, faith in God, God, grape, I am the vine, Jesus, Moses, promise, trust in God, twelve spies, vine. This Bible verse has been memorized at some point in every children’s ministry. This is a great attitude to teach our kiddos and these crafts will be a constant reminder of this. 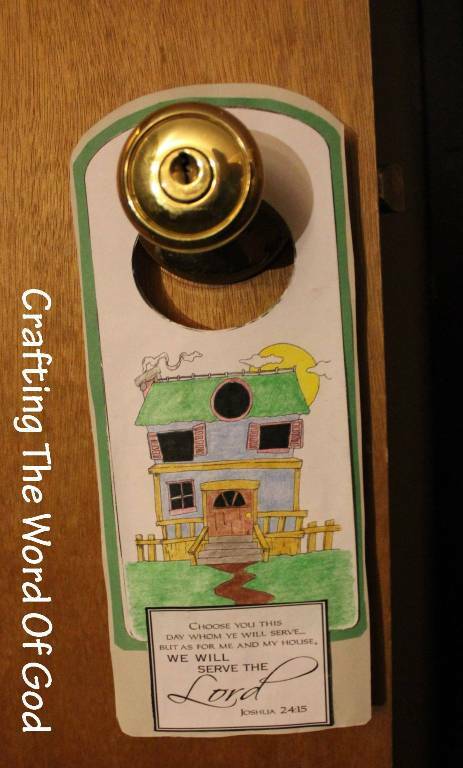 This first craft is a simple hanging sign. After the children finish it they can place it on their bedroom door, on their bed post or even hang off the car rear view mirror. Color and cut out all of the pieces.. Glue the three large rectangular pieces together from biggest to smallest. Then glue on the Bible verse piece. Lastly cut out the space to be able to slip it onto the door knob. If your kids like they can then add stickers, jewels, or draw on designs. Let them use their imagination. I found this version online and immediately fell in love with it. Sadly no template was available. So I decided to come up with my own. Place this finished craft on your mantle or table. At this point if you choose you can paint the paper plate. First glue the banner onto the paper plate. Then the house and finally the bush. Cut out the center circle of the plate cutting around the house. Then fold the plate in half to form the stand. 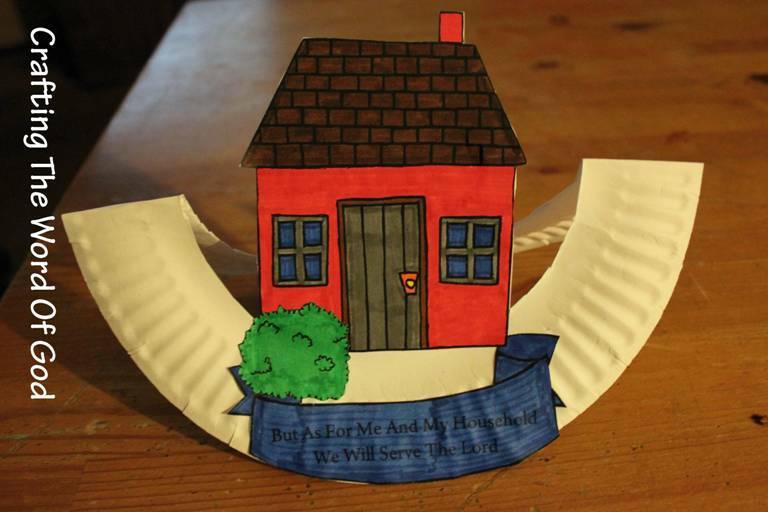 This entry was posted in Bible Crafts, Joshua, OT Crafts and tagged as for me and my house, bible crafts, craft, crafts, Joshua, Lord, obedience, serve, service, we will serve the Lord.